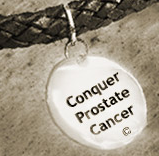 Conquer Prostate Cancer Now: Early-Stage Prostate Cancer - a New Way to Determine if It's Aggressive? Early-Stage Prostate Cancer - a New Way to Determine if It's Aggressive? Determining how aggressive a newly diagnosed early-stage prostate cancer might be, until now, has been the Holy Grail of prostate cancer science. For that reason I was delighted to read a recent announcement that Dana Farber researchers believe they have discovered 4 genetic markers that can determine with 92% accuracy how aggressive a patient's prostate cancer tumor is when diagnosed early. For more about this see the February 5, 2011 edition of Smart About Health (http://smartabouthealth.net/diseases/2011/02/05/new-test-detects-aggressiveness-of-prostate-cancer/comment-page-1/#comment-219446. Quite incredibly this discovery of how aggressive an early-stage prostate cancer might become, far exceeds any accuracy reported until now. However the Dana Farber study has to be reconfirmed and validated before we get too excited about it. To be valid and reliable, this far-reaching, upbeat conclusion requires a scientific, randomized selection of a large number of patients studied prospectively and "longitudenally," meaning, over 10-15 years. It also needs to be successfully duplicated by other researchers. Once this occurs, this gene marker discovery may become one of the major turning points in modern science! I say that because prostate cancer, like breast cancer, is one of the most prevalent non-skin cancers. Subject to getting the full report, this news greatly increases the likelihood that active surveillance will become the gold standard for the vast majority of newly diagnosed prostate cancer patients. After all, some 80% of prostate cancer diagnoses occur when men's prostate cancers are confined within the prostate, - which by definition means at an early stage. We healthcare educators and survivors and the entire medical community need to look out for new evidence to corroborate this study. This is born out by a Wall Street Journal article at WSJ.com, which mentions that the Dana Farber study, for a number of years, folowed 400 men who were subjects in a prior Harvard study. (See http://online.wsj.com/article/SB10001424052748703960804576120194229203936.html. Only when fully confirmed, will such an announcement give new hope to hundreds of thousands of men annually, as well as to their wives and partners who love them. Until further details of this study are verified and replicated, we can only hope that this report is telling it like it is! At the very least, we can see that scientists are at least on the way to making things better for us all.